Find a lower price online up to 24-hours prior to check-in and we’ll refund the difference. Save up to $387* on holiday packages when you bundle a hotel and flight. With more than 550 airlines and 665,000 properties worldwide, it’s easy to find your best holiday. Fri., 31 May - Mon., 3 Jun. Thu., 4 Jul. - Sun., 7 Jul. Fri., 14 Jun. - Mon., 17 Jun. Sat., 29 Jun. - Wed., 3 Jul. Wed., 3 Jul. - Sun., 7 Jul. Previous image, 64 total items. Next image, 64 total items. Pop quiz: Which Whitsundays Island has its own airport so you can start your getaway the moment you land? Okay, maybe the title of this page gave it away—but that doesn’t make it any less true, or any less exciting. Especially since Hamilton Island is a gorgeous, jungle-clad paradise designed to give you the holiday of your dreams. Not only does this little gem in the ocean have its own reef, it’s about as close as you can get to the Great Barrier Reef and still have a roof over your head at night. It’s also smack in the middle of other islands, like Cumberlands, Long and the ruler of them all, Whitsunday. Oh, and Conway Forest Reserve on the mainland? Just a boat ride away. Enjoy a whole flock (or herd?) 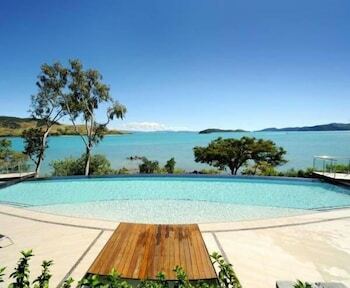 of islands with our Hamilton Island holiday packages. Your travel blog will thank you. Jump in the water, of course! Between the kayaks, stand-up paddleboards, windsurfers, catamarans, jet skis and your very own arms and legs, Catseye Bay has everything you need for the water sports of your choice. If actually being in the water isn’t your thing, then take a time-out and just live the resort life with massages, grub and never-ending fruity drinks with umbrellas in them. Getting itchy for a few rounds of golf? You’ll know by the way your body automatically falls into your swing stance every time you get out of your beach chair. Just boat on over to Hamilton Island Golf Club. Technically, the course is on Dent Island, but who keeps track on holidays to Hamilton Island, anyway? You’ll be soaking up the sun all day, but just because it goes down every night doesn’t mean you have to stop your getaway. Enjoy a fabulous four-course meal with your favourite vintage while cruising around the island. Each resort offers at least one dining experience for landlubbers too, so you’ll have plenty of eats on shore. Then, of course, there’s that fish you caught out by the reefs this morning. Some of our Hamilton Island packages include accommodation with cooking facilities, so you can be the next Iron Chef right in your own room. With so many islands nearby, you’ll have plenty of places to visit. Of course, there’s plenty to see right here on this one. Check out our Hamilton Island car rental options and go cruising. Hit Resort Drive right on Catseye Beach or head over to the marina. 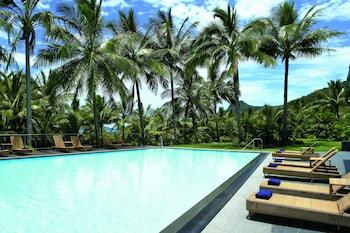 When you want to get away from it all on Hamilton Island holidays, drive out to Coral Cove. And for ultimate privacy, swim across the narrow end of Driftwood Bay to discover Escape Beach. Had enough relaxation? While that might sound crazy to some, we know there are plenty of travellers who are city slickers at heart. That’s why we also offer Townsville holiday packages. When you book with Wotif, you know you’re getting the best Hamilton Island package deals, plus savings anywhere else your wanderings take you. Book your getaway today! Brisbane is a record-breaking kind of place, although you might never guess from its laid-back attitude. It’s the home of the first man to fly across the Pacific, Australia’s largest town hall, and its first dedicated entertainment district. Yes, this city has pioneered many important things (hey, nightlife is just as important as the technology to fly across the sky at breakneck speeds). And when it comes to package holidays in Brisbane, well, they’ve aced that test, too. You’ll soon see for yourself, because irresistible Brisbane is in your future. Surfers flock to the Gold Coast like moths to a flame, but even if hanging 10 isn’t your thing, you can still have the time of your life in this Queensland destination. With its golden sun-drenched beaches, breezy seaside towns, rugged mountain hikes and unique markets, the Sunshine Coast is hard to beat. Port Douglas marks the spot where the rainforest meets the reef. Discover two World Heritage-listed treasures side by side in this coastal town in Tropical North Queensland. For beach-lovers, getaways to the capital of the Gold Coast are worth their weight in, well, gold. As one of the best places to hang ten in Australia, Surfers Paradise really earns its name. This place is incredibly laid-back, so don’t let any of those high-rises sparkling in the sun fool you. With 52km of golden beaches and just 300 sunny days to enjoy them each year, there simply isn’t time to waste rushing around. So stroll through shops, restaurants, bars and clubs. Take a dip in the ocean. Get baked (by the sun, that is) on the sand. Whatever’s clever. A coastal Queensland city with a tropical climate, Cairns is a great place to get away from it all. What do celebrities, families and solo surfers seeking gnarly waves all have in common? Well, they all love Broadbeach, for starters. It’s the perfect spot for a Gold Coast getaway—just south of all the attractions of Surfers Paradise, and home to some of the best shopping and dining in the area. Just ask Kylie Minogue. If you can’t get in touch with her, check out our guide below, then hurry up and book Broadbeach holiday packages! Noosa Heads is one of those places everyone loves. No longer a quiet summer getaway, it attracts glamorous couples and sun-seeking families alike. 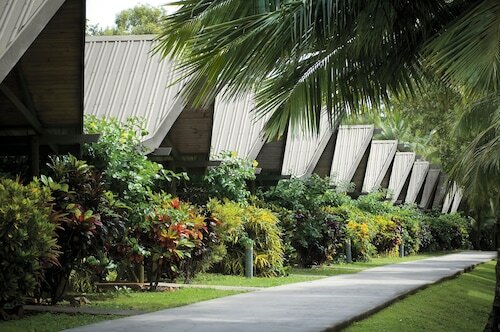 Relax resort-style in Palm Cove, a coastal community with its sights fixed firmly on the Coral Sea. Just because a town has the word “cool” in it doesn’t actually mean it really is cool, right? There’s no way it could be lined with picture-perfect beaches. There’s no way it could have happening bars full of lively locals who want to buy you a schooner or two. There’s no way a place like that exists. It’s all rubbish! Oh, how wrong the above statement is, because Coolangatta on Australia’s Gold Coast is just that. The waves from Snapper Rocks to Kirra are world-class. The bars along The Patch seem to never stop raging. So yeah, we think it’s about time you book one of Wotif’s Coolangatta holiday packages and see it for yourself. We get it, you love Melbourne. So do we. But how much of it have you really seen? If exploring new neighbourhoods is your cup of coffee, then beat feet for Southbank. This trendy, stylish, hip and very cool nook of the city should be high on your list of places to visit, for a bunch of reasons we’re going to tell you about below. Browse our list of ridiculous Southbank packages and book your dream holiday right now. If you were in Mooloolaba, you could reach the beach from your accommodation in the time it takes to finish reading this paragraph. Tempted yet? You’re never far from the water in Noosaville. This part of Noosa hugs the shores of Lake Weyba to the south and the Noosa River to the north, and it’s just a short drive from the beach. Sunshine Coast is one of Australia’s most popular holiday destinations, thanks to its pristine, swimmable beaches and near-perfect weather. There’s a town here for everyone, whether you’re taking the whole family to Mooloolaba or want to party down in Maroochydore for a weekend. Up in Noosa Heads, outdoor adventures topped off with relaxing spa treatments and glittering shopping avenues reign supreme. But you, traveller, already knew all that. You’ve narrowed down your search even further, having already chosen the luxurious-yet-adventurous Noosa Heads as your next getaway. Now, you’re investigating Hastings Street package deals—so you can be right where all the action is. You might expect a spot called “Mount Tamborine” to attract a lot of folk singers. And maybe it does—if those folk singers also crave epic views of the Gold Coast and the Pacific Ocean from a height of 578 metres, that is. Even then they’d be in for a surprise, because despite its name and elevation, Mount Tamborine is actually a plateau in the lush Gold Coast hinterland. If you’re visiting the Gold Coast or Brisbane, Tamborine Mountain makes a fabulous day trip. If you can’t wait to explore wild jungles that look like somewhere dinosaurs might still roam, then Mount Tamborine and the Gold Coast hinterland is a destination that stands on its own foothills. Either way, our Mount Tamborine holiday packages can help you get here in style. Pack your hiking boots and remember: Tyrannosaurus Rex can’t see you if you stand still! Airlie to rise, Airlie to the beach! Welcome to the gateway of the Whitsundays, those dreamy vacation islands between mainland Australia and the Great Barrier Reef. This part of the country is simply jam-packed with beautiful beaches, exciting water sports and eco adventures. While there are a few places you can start your Whitsundays vacation, Airlie Beach is one of the most versatile. Long a party town for backpackers, it’s recently developed some classy resorts and sleepy bits of town for travellers who are more mature,or those who have families with them. Whatever your travel persona, you can enjoy this cruise ship hub from the beach, the boardwalk or a boat on the marina. Stay a few nights as part of your Whitsundays adventure, or explore the town all on its own. Either way, our Airlie Beach holiday packages are here to help. Pack your thongs and swimsuit and get ready to work on your tan! Have an up-close experience with macaws and Australian parrots in this aviary and garden surrounded by rainforest, which overlooks the Glass House Mountains. With direct access to the beach, this Hamilton Island apartment building is in a national park and within 1 mi (2 km) of WILD LIFE Hamilton Island, Catseye Beach, and Hamilton Island Marina. Hamilton Island Golf Club is 0.8 mi (1.3 km) away. 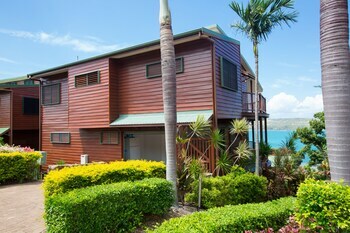 Reef View Hotel overlooks Catseye Beach and the reef on Hamilton Island. Hamilton Island Marina is a 10-minute walk, and there’s a free shuttle to the airport, a 5-minute drive. Bars, restaurants, the beach, and Hamilton Island Yacht Club are all within easy walking distance. 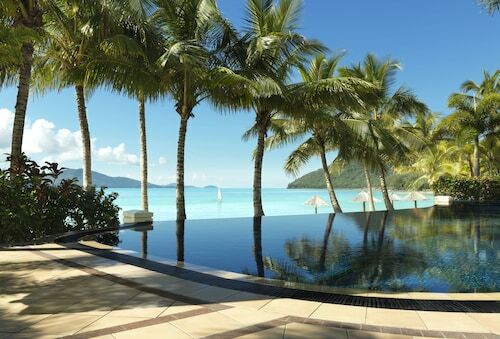 This family-friendly Hamilton Island resort is located near the airport, just steps from Catseye Beach and WILD LIFE Hamilton Island. Hamilton Island Marina and Hamilton Island Golf Club are also within 6 mi (10 km). 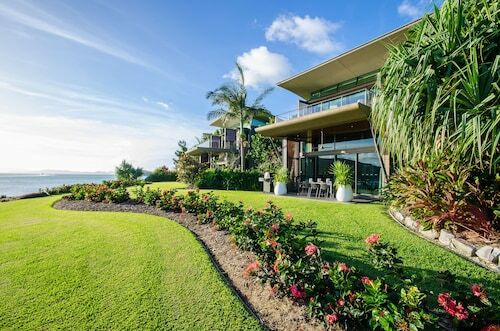 This family-friendly Hamilton Island vacation home is within a 10-minute walk of Catseye Beach and Hamilton Island Marina. Hamilton Island Golf Club is 0.6 mi (0.9 km) away. 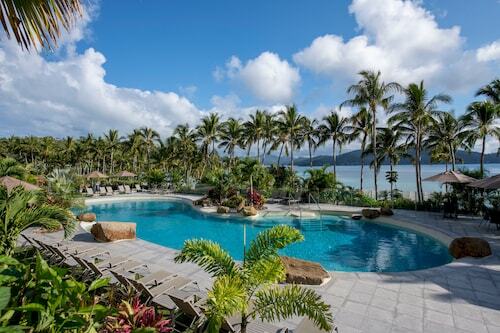 Located in Hamilton Island, this beachfront resort is in the city center and within a 15-minute walk of Catseye Beach and Hamilton Island Marina. WILD LIFE Hamilton Island is 0.2 mi (0.4 km) away. *Savings based on all package bookings made with Flight + Hotel on Wotif.com from January 1, 2018 to December 31, 2018, as compared to the price of the same components booked separately. Savings will vary based on origin/destination, length of trip, stay dates and selected travel supplier(s). Savings not available on all packages.